Home > MVP – Really going from bike to car? 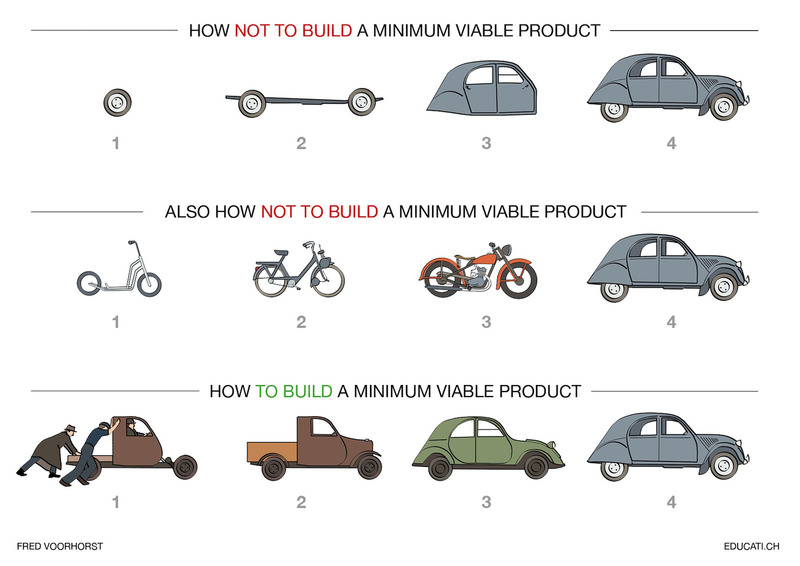 A Minimum Viable Product (MVP) is defined on Wikipedia as follows: “In product development, the minimum viable product is the product with the highest return on investment versus risk. ” In short, it is a (often first) product with all fundamental features, from which to elaborate, and which can grow into a full product through a process of testing and updating, trying to keep the features to what is fundamental to the product and user needs/expectations. On twitter, every now and then the following image passes by (for example in this tweetby user testing), but I think it only partly correct. In my opinion, developing a MVP means developing a sequence of prototypes through which you explore what is key for your product idea and what can be omitted. This means that if you are planning to develop a personal transporter like a car, the very first item you develop will be a personal transporter like a car, but stripped down to what you think at the time of developing the prototype is the bare minimum. Testing and sounding may result into a new prototype etc until you have your product which you feel is minimally viable. Nowhere in developing a personal transporter like a car, you end up developing a full motorcycle, and I seriously doubt that the starting point will be a skate-board or a children’s scooter, as shown below.